Home » Kuril Islands. 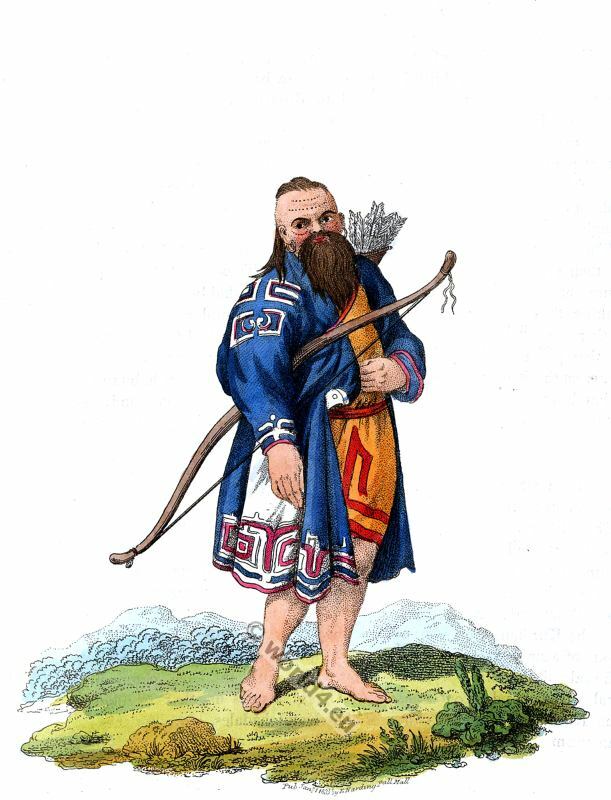 Aboriginal Ainu in traditional costume. THE Kuriles are a chain of islands extending from the south promontory of Kamchatka as far as Japan. The Japanese have long frequented these islands; but Europe is solely indebted to Russia for a knowledge of their existence. In the year 1706, the Russians discovered those islands lying nearest to Kamchatka; and, in 1710, some Japanese, who were shipwrecked on that peninsula, furnished them with fresh information upon this subject. In the following years, a few Cossacs made several expeditions to the most northern of the Kuriles; and in 1739 they were discovered by Walton and Spangberg, who navigated as far as Japan. The Kurilians are better formed than the inhabitants of Kamchatka, and their physiognomy is much more agreeable. They are of the middling stature, are very hairy, and wear their beards remarkably long: generally speaking, they are round visaged, and of a swarthy complexion. They live together in the most perfect harmony, and are distinguished for the veneration they pay to old age. The Kurilians construct their huts in the same manner as the Kamchadales, but are far more cleanly in their habitations. As they have no dogs, the use of the sledge is unknown to them, and they are obliged to travel on foot, even in winter. To avoid sinking in the snow, they make use of those large skates, to which our travellers have given the name of rackets. The men have a custom of blackening the middle of their lips, and the women of dying them all over of the same colour. Both sexes paint various figures upon their arms, &c.
Their dresses are left open in the front: they are made of the skins of sea-fowls, otters, and foxes. The Kurilians build canoes for the purpose of pursuing the whale, and are extremely sagacious in discovering the precise spot where the animal conceals itself. They wound it by means of poisoned darts. What with the chace and the traffic they carry on with their neighbours, the Kurilians are’a richer people than the inhabitants of Kamchatka: the skin of a single sea-otter produces them more than a Kamchadale gains by the sale of the skins of twenty foxes. The Kurilians have, commonly, several wives, besides concubines. MI. Georgi assures us, that the religion of the Kurilians, as well as that of the Kamchadales, are branches of Shamanism.